According to the National Fire Authority, preliminary investigations into yesterday’s Laqere bus fire has revealed that the fire started in the engine compartment. Meanwhile, FIJI Bus Operators Association says they are just as concerned with bus fires as the rest of the public. The association says that passenger safety remains paramount for bus operators. The bus which was carrying 10 passengers was engulfed in flames while travelling to Suva from Makoi in Laqere Nasinu. 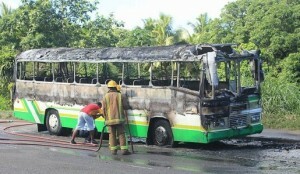 One Response to "NFA: Bus fire started from engine compartment"
its the e-ticketing machine that is causing this fire..